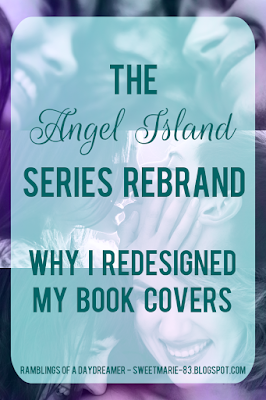 At the beginning of this week, I revealed the brand new covers for my Angel Island series. It wasn’t an easy decision to redesign the covers, but after thinking about it for at least the last year, I knew it was necessary, especially from a marketing standpoint. I published Waiting for the Storm in April 2013. When I was looking for an image for the cover, the only thing I knew for sure was that I wanted something with a beach setting, and probably a young couple. After a ton of searching, I found an image of a girl standing alone on a stormy beach, and I knew that was it. It was literally a scene from the book. That girl was Charlotte, no question. A little less than a year later, it came time to design the cover for After the Storm, the standalone sequel to Waiting for the Storm. I started searching for images of couples and quickly discovered the majority of pics were white couples. The problem with that? River is Mohawk. I found a few images that would have been perfect if the guy hadn’t had light skin and/or light hair. I talked to some of my close writing friends, people who had been with me on my writing journey from the beginning, and one of them suggested I stick with the theme of a girl alone so it would tie with Waiting for the Storm. When I found an image of a girl walking along a sunny beach, holding a rainbow umbrella, it seemed perfect. When it came time to design the cover for Take Them by Storm, I didn’t bother searching for couple shots, I just looked for solo girls. As with Waiting for the Storm, when I found the image for Sadie’s cover, I knew it was perfect. The girl was wearing an almost identical outfit to one Sadie had worn in After the Storm. The suitcases were perfect too since the story is about Sadie leaving Angel Island to go to college. The cover is a bit different from the others stylistically, but I figured it fit because the other two are Young Adult and Take Them by Storm is New Adult. Jump ahead a few years, and while I love all three original covers and think they’re a great representation of the characters, they’re not a good representation of their respective genres. As a visual person (and a self-proclaimed cover snob - I do judge a book by its cover), I’ve learned what sells and what doesn’t. Just because something is pretty and the author thinks it's a good representation of the book and/or characters doesn't mean it's going to sell. There are millions of authors out there publishing books at an unbelievable rate, leaving a small window to grab a reader's attention and make them take a look at your book. 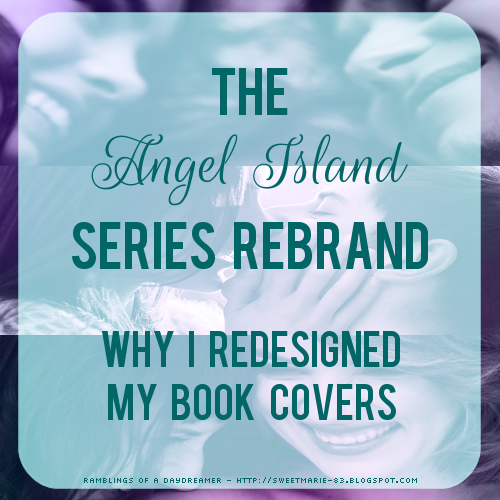 So while I loved the original covers, I had a feeling they were part of the reason behind my less-than-stellar sales. I knew the stories were good, I knew the writing was good, and all three books were priced well, so it came down to the covers. Because the thing is, they could have been any number of genres; I think it’s obvious they’re contemporary, but contemporary what? Young adult? New adult? Adult? Romance? Chick lit? Literary fiction? It was impossible to tell from the covers. Something I knew for sure the new covers had to have was couples. After learning a lot about branding in the last few months, I also wanted all the covers to match so people knew (beyond the titles) they tied together as a series. I did a lot of research, scoured my favourite stock photo site, and made countless mock-ups that ended up in the trash, all before finally having an 'aha' moment. From there, the covers came together with ease, and I couldn't be happier with them. 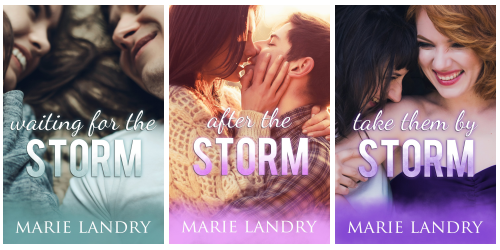 They’re a much better representation of their respective genres - contemporary Young Adult for Waiting for the Storm and After the Storm, and contemporary New Adult LGBTQ+ for Take Them by Storm. I’m particularly pleased that Sadie’s cover finally has a f/f couple, since I think the book got overlooked by a lot of people searching for f/f stories because of the ambiguous original cover. This is one of the many things I love about self-publishing: the freedom to try things. Take risks. Make changes. It's a lot of work, and it can be stressful and frustrating, but I wouldn't want to give up the control I have over my own books. I hope you like the new covers as much as I do, and I hope you'll check out the Angel Island series (which, by the way, can all be read as standalones). You can find all the buy links (Amazon, Kobo, Nook, iBooks, and Smashwords) here. The new covers are pretty!